Ojala, M., Kaasik. S. & Pantti, M. (2018) Presidential Speeches and the online politics of belonging: affective-discursive positions towards refugees in Finland and Estonia. European Journal of Cultural Studies, forthcoming. Ojala, M., Pantti, M. & Kangas, J. (2018) Professional Role Enactment amidst Information Warfare: War Correspondents Tweeting on the Ukraine Conflict. Journalism, 19(3), 297–313. Ojala, M. & Pantti, M. (2017) Naturalising the New Cold War: The Geopolitics of Framing the Ukrainian Conflict in Four European Newspapers. Global Media and Communication 13(1), 41–56. Ojala, M., Kangas, J. & Pantti, M. (2017) Whose War, Whose Fault? Visual Framing of the Ukraine Conflict in The Guardian, Die Welt, Dagens Nyheter and Helsingin Sanomat. International Journal of Communication 11, 474-498. Polynczuk-Alenius, K. & Pantti, M. (2017) Branded Solidarity in Fair Trade Communication on Facebook. Globalizations 14(1), 66–80. Pantti, M. (2016) Disgust and Deservingness: Lay Moralities in Finnish Online Discussions about Violence towards Refugees. Javnost—The Public 23(4). Khaldarova, I. & Pantti, M. (2016) Fake News: Struggle over News Coverage of the Ukrainian Conflict. Forthcoming in Journalism Practice. Pantti, M. (2015) Grassroots Humanitarianism on YouTube: Ordinary Fundraisers, Unlikely Donors, and Global Solidarity. International Communication Gazette 77(7), 622–636. Kangas, J., Ojala, M. & Pantti, M. (2015) Lännessä olemme, itään katsomme: Ukrainan kriisin kehykset ja Venäjän esitykset suomalaisissa mediakuvissa. Media & viestintä 38(4), 187–208. Ahva, L. & Pantti, M. (2015) Näkökulmia journalismin läheisyys-käsitteeseen: Amatööri-kuvat kriisiuutisissa toimittajien ja yleisön tulkitsemina. Media & viestintä 38(1), 23–39. Pantti, M. & Sirén, S. (2015) The Fragility of Photo-Truth: Verification of Amateur Images in Finnish Newsrooms. Digital Journalism 3(4), 495–512. Ahva, L. & Pantti, M. (2014) Proximity as a Journalistic Keyword in the Digital Era. Digital Journalism 2(3), 322–333. the Visual Framing of the Syrian Conflict in Seven Newspapers and their Online Editions. JOMEC Journal 4, 1–22. Andén-Papadopoulos, K. & Pantti, M. (2013) Re-imagining Crisis Reporting: Professional Ideology of Journalists and Citizen Eyewitness Images. Journalism 14(7), 960–977. Andén-Papadopoulos, K. & Pantti, K. (2013) The Media Work of Syrian Diaspora Activists: Brokering between the Protest and Mainstream Media. International Journal of Communication 7, 2185–2206. Lepp, A. & Pantti, M. (2013) Memories of Watching Finnish Television in Estonia during Soviet Occupation. VIEW: Journal of European Television History and Culture 2(3). Pantti, M. (2013) Getting Closer? Encounters of the National Media with Global Images. Journalism Studies 14(2), 201–218. Pantti, M. & Wahl-Jorgensen, K. (2011) Not an Act of God: Anger in British Disaster Coverage. Media, Culture, and Society 33(1), 105–122. Pantti, M. (2010) The Value of Emotion: An Examination of Television Journalists’ Notions on Emotionality. European Journal of Communication 25(1), 168–181. Pantti, M. & Bakker, P. (2009) Misfortunes, Sunsets and Memories: Non-professional Images in Dutch News Media. International Journal of Cultural Studies 12(5), 471–489. Pantti, M. (2009) One Half of the Nation Is Watching the Other Half: Ordinary People and Emotional Expression in Dutch Public News. Javnost – The Public 16(2), 77–94. and the Sacred Centre of the Society. Media, Culture & Society 31(1), 119–135. Pantti, M. & Wahl-Jorgensen, K. (2007) On the Political Possibilities of Therapy News. Social Responsibility and the Limits of Objectivity in Disaster Coverage. Studies in Communication Review 1, 3–25. Aslama, M. & Pantti, M. (2007) Flagging Finnishness: Reproducing National Identity in Reality Television Series Extreme Escapades. Television and New Media 8(1), 46–67. Pantti, M. & van Zoonen, L. (2006) Do Crying Citizens Make Good Citizens? Aslama, M. & Pantti, M. (2006) Talking Alone. Reality TV, Emotions and Authenticity. European Journal of Cultural Studies 9(2), 167–184. Pantti, M. (2005) Masculine Tears, Feminine Tears – and Crocodile Tears: Mourning Olof Palme and Anna Lindh in Finnish Newspapers. Journalism: Theory, Practice and Criticism 6(3), 357–377. Pantti, M. & Wieten, J. (2005) Mourning Becomes the Nation: Television Coverage of the Murder of Pim Fortuyn. Journalism Studies 6(3), 301–313. Wieten, J. & Pantti, M. (2005) Obsessed with Audience: Breakfast Television Revisited. Media, Culture, and Society 27(1), 21–39. Pantti, M. (Ed.) (2016) Media, Communication Power and the Ukraine Conflict: Narratives and Practices of War in a Hybrid Media Environment. New York: Peter Lang. 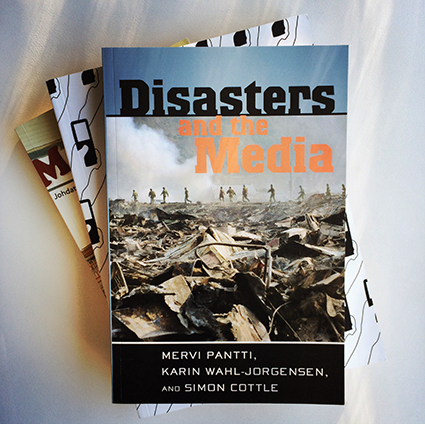 Pantti, M., Wahl-Jorgensen, K. & Cottle, S. (2012) Disasters and the Media. New York: Peter Lang Publisher. Andén-Papadopoulos, K. & Pantti, M. (Eds.) (2011) Amateur Images and Global News. Bristol: Intellect. ja sen tutkimukseen. Helsinki: Loki-kirjat. 2nd edition 2009; 3rd edition 2011. Nieminen, H., Aslama, M. & Pantti, M. (2006) Media ja demokratia Suomessa. Kriittinen näkökulma. Helsinki: Oikeusministeriön julkaisuja 11. Pantti, M. (2001) ’Kansallinen elokuva pelastettava’. Elokuvapoliittinen keskustelu kotimaisen elokuvan tukemisesta itsenäisyyden ajalla. Helsinki: Suomalaisen Kirjallisuuden Seura. Pantti, M. (2019) Disasters as a Domain of Humanitarian Communication. In Chouliaraki, L. & Vestergaard, A. (Eds.) Routledge Handbook of Humanitarian Communication. Taylor & Francis. Pantti, M. (2018) Journalism and Witnessing. In Wahl-Jorgensen, K. & Hanitzsch, T. (Eds.) Handbook of Journalism Studies (2nd edition). Routledge. Pantti, M. (2018) Crisis and Disaster Coverage. In T. Vos & F. Hanusch (Eds.) The International Encyclopedia of Journalism Studies. Wiley. Nikunen, K. & Pantti, M. (2018) Tapaus Ku Klux Klan: Affektiivinen julkisuus, moraaliset tunteet ja tahmaiset kuvat. Media, pakolaisuus ja tunteet. Tampere: Vastapaino. A Cross-cultural Comparison of the Syrian Conflict. In T. Vos & F. Heinderyckx (Eds.) Gatekeeping in Transition. New York: Routledge. the Politics of Reportage: The Arab Spring. Palgrave Macmillan. Pantti, M. (2014) ‘The Journalism of Astonishment’: Engaging the Audience through Emotional Amateur Visuals. In M. Moshe (Ed.) Emotion Industries. New York: Nova Science Publishers. Pantti, M. (2014) Getting Closer? Encounters of the National Media with Global Images. In L. Chouliaraki & B. Blaagaard (Eds.) Cosmopolitanism and the New News Media. London: Routledge. Wahl-Jorgensen, K. & Pantti, M. (2013) Disasters and the Ethics of Journalism. In S. Ward (Ed) Global Media Ethics: Problems and Perspectives. Wiley-Blackwell. Pantti, M. & Tikka, M. (2013) Cosmopolitan Empathy and User-Generated Disaster Appeal Videos on YouTube. In T. Benski & E. Fisher (Eds.) Internet and Emotions. New York: Routledge. Aslama, M. & Pantti, M. (2012) Labourers of the Real: Authenticity Work in Reality Television. In R. Dhar & P. Rana (Eds.) Media in the Swirl. Delhi: Pentagon Books. Pantti, M. & Andén-Papadopoulos, K. (2011) Transparency and Trustworthiness: Strategies for Incorporating Amateur Photography into News Discourse. In K. Andén-Papadopoulos & M. Pantti (Eds.) Amateur Images and Global News. Bristol: Intellect. Pantti, M. (2010) Disaster News and Public Emotions. In K. Döveling, C. von Scheve & E. Konijn (Eds.) Handbook of Emotions and Mass Media. London: Taylor & Francis. Pantti, M. & van Zoonen, L. (2009) And the Winner is… Authenticity Work and Gender in Reality TV. In L. Baruh & Ji Hoon Park (Eds.) Reel Politics: Reality Television as a Platform for Political Discourse. Cambridge: Cambridge Scholars Publishing. Pantti, M. (2009) Wave of Compassion: Nationalist Sentiments and Cosmopolitan Sensibilities in the Finnish Press Coverage of Indian Ocean Tsunami Disaster. In U. Kivikuru & L. Nordin (Eds.) After the Tsunami. Crisis Communication in Finland and Sweden. Göteborg: Nordicom. Lunt, P. & Pantti, M. (2007) The Emotional Public Sphere: Social Currents of Feeling in Popular Culture. In R. Butch (Ed.) Media and Public Spheres. Houndmills, Basingstoke: Palgrave. Aslama, M. & Pantti, M. (2007) Tunnustuspuhe todellisuustelevisiossa. In H. Kujansivu & L. Saarenmaa (Eds.) Tunnustus ja todistus kulttuurisina muotoina. Helsinki: Gaudeamus. Pantti, M. (2007) Portraying Politics: Gender, Politik und Medien. In C. Holtz-Bacha & N. Reiling (Eds.) Politikerinnen kommen vor. Wie die Medien mit Frauen in der Politik umgehen. Wiesbaden: VS Verlag für Sozialwissenschaften. Pantti, M. & Wieten, J. (2006) Infotainment for Breakfast: The Production of Early Morning News. In A. Schorr & S. Seltmann (Eds.) Changing Media Markets in Europe and Abroad. New Ways of Handling Information and Entertainment Content. Berlin: Pabst Science Publishers. Pantti, M. (2005) Art or Industry? Battles over Finnish Cinema during the 1990s. In T. Elkington & A. Nestingen (Eds.) Cinema in a Transnational North: Nordic National Cinema in Transition. Detroit: Wayne State University Press. Pantti, M. (2004) Must-See Medicine Women: Breaking Limits of Genre and Gender in ER. In R. Schubart & A. Gelsvik (Eds.) Femmes Fatalities: Representations on Strong Women. Gothenburg: Nordicom.